The restaurant "Dolon". Bukhara, Restaurants of Bukhara, Restaurants of Uzbekistan, Restaurant "Dolon", It is interesting. The restaurant “Dolon” is situated between trade domes in old part of Bukhara. Interior design is in a traditional style. At lunchtime you can hear pleasant background music. The main difference of the restaurant “Dolon” is that sitting in one of the comfortable halls or on the terrace, which offers panoramic view of Bukhara, you can admire the beauty of ancient city. 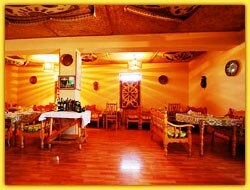 You will be surprised by rich variety of national and European dishes and its exquisite and unforgettable taste. Working hours: from 09:00 am till 12:00 pm.